Fried rice makes my heart sing. Now this fried rice isn’t going to win any accolades among those who value authenticity. In fact, I’m hesitant to even call it fried rice because there’s no actual frying happening. As with most of our backpacking recipes, this meal just requires adding water, simmering, and some stirring. However, it definitely captures the essence of fried rice despite the lack of wok action. The one thing that would bring this meal together and make it even more legitimate is the addition of eggs, but I omit them because they take up a fair amount of space (and because I had none on hand…). Not only that, freeze dried eggs can be expensive and since eggs aren’t a main ingredient it’s cheaper and easier to leave it out altogether. Don’t fret though, there’s plenty of protein in the chicken. The most difficult part of this backpacking recipe might be the sesame oil, which I’ve turned into a paste. Getting it into paste form isn’t actually necessary, but is particularly useful because while you might carry a bottle of olive oil to use as a calorie boost, carrying a separate bottle of sesame oil isn’t practical and using only sesame oil would significantly change flavor of your other meals. For this dinner, the sesame oil is a necessary taste and flavor component, but we only need a small amount. Because it’s unlikely you’ll be using enough sesame oil throughout a trip to carry a whole bottle's worth, and I’ve never seen it sold in single-serving packets, we need to find a way to bring just the right amount. The two most convenient options are making your own single serve packets by vacuum packing or transporting it in the smallest container available. Despite those very reasonable options I choose to take a page from Grant Achatz and delve into the world of molecular gastronomy, minus the culinary part. In short, I mix sesame oil with maltodextrin (N-Zorbit M) and it magically turns into a paste. Keep your eyes peeled for a future blog post that goes into in more detail. Carrying a small amount of sesame oil in a container while backpacking creates a large amount of bulk and unnecessary weight, moreover, it has the possibility of leaking. If you vacuum pack your own single-serving of sesame oil it’s lighter than a container but can possibly be punctured and create a mess. The only reason for all this hocus pocus boils down to avoiding extra weight and achieving cleanliness. If the baggy containing the sesame oil paste happens to spring a leak, nothing happens. The maltodextrin holds the oil in an incredibly viscous state so it won’t seep out. It also allows you add it into the same bag that holds all the other dry spices that are added at the very end. Another mystical food magic you can leverage is instant rice, or minute rice, instead of dehydrating your own. This will save a significant amount of prep time and cook time. There’s something in the way minute rice is made that doesn’t require nearly as much simmering as dehydrated rice. 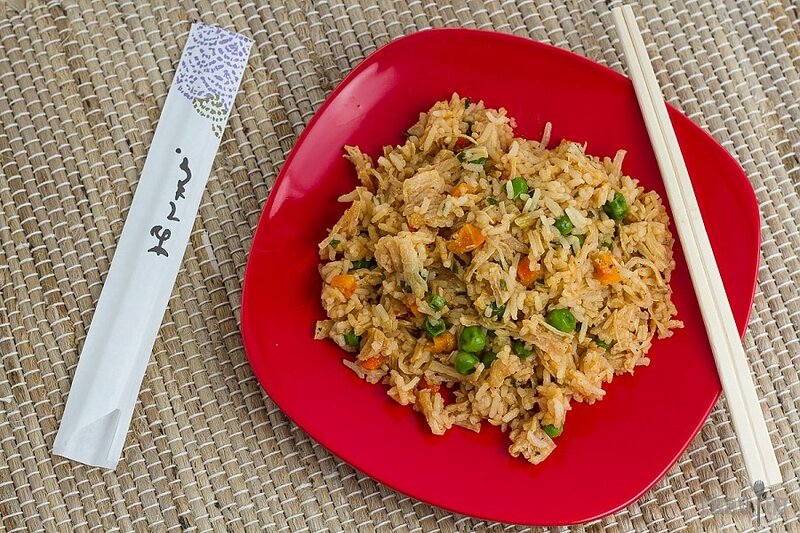 However, part of the deliciousness of fried rice is that it’s made with jasmine rice. Which is typically not the same thing as instant rice, but who are we kidding, it’ll all taste great out on the trail! So fire up your stove, make this recipe, whip up some sesame noodles, and become a trail angel serving up delicious take-out-esque goodness. Add contents of Bag 1 (rice, chicken, peas & carrots, and chives) into pot with enough water to cover all ingredients. Simmer for 5-10 minutes or until rice and chicken have been rehydrated, or to desired consistency. Stir until all spices have dissolved. If things aren't dissolving, add a splash of water and place back on stove.